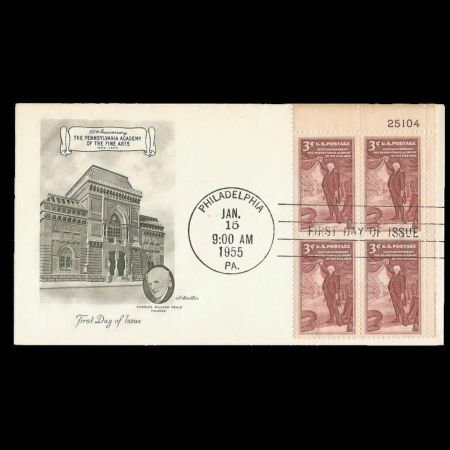 USA 1955 "150th Anniversary of the Pennsylvania Academy of the Fine Arts"
The stamp was issued in conjunction with the Sesquicentennial Celebration of the Pennsylvania Academy of Fine Arts. 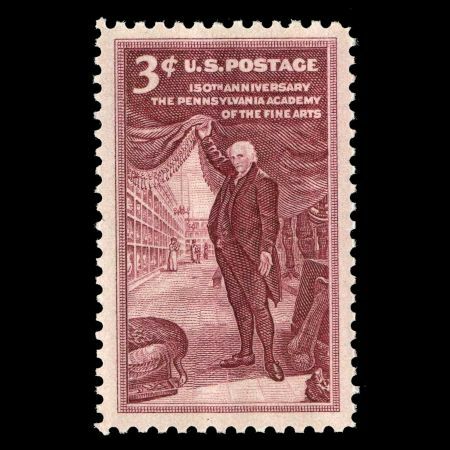 The stamp pictures Charles Wilson Peale's self-portrait, "The Artist in His Museum." Many of the museum's exhibits were collected by Peale, and he includes some of them in his painting. 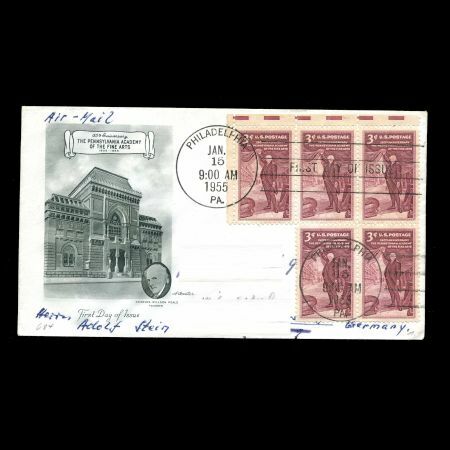 The stamp features several, like a wild turkey ready to be preserved. 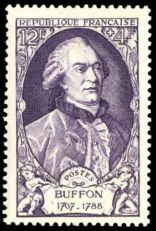 The stamp also shows a great mastodon bone, in honor of one of Peale's greatest achievements - the rebuilding of a mastodon's skeleton. The Pennsylvania Academy of the Fine Arts was founded in 1805 by painter and scientist Charles Wilson Peale (1741-1827), sculptor William Rush, and other leading business leaders in 1805. It is the oldest art museum and school in the nation. The museum is world famous for its collection of 18th-, 19th-, and 20th-century American paintings, sculptures, and works on paper. The Academy's museum building was opened in 1876. It was designed by the American architects Frank Furness and George Hewitt. The building, which is a National Historic Landmark, was restored in 1976. 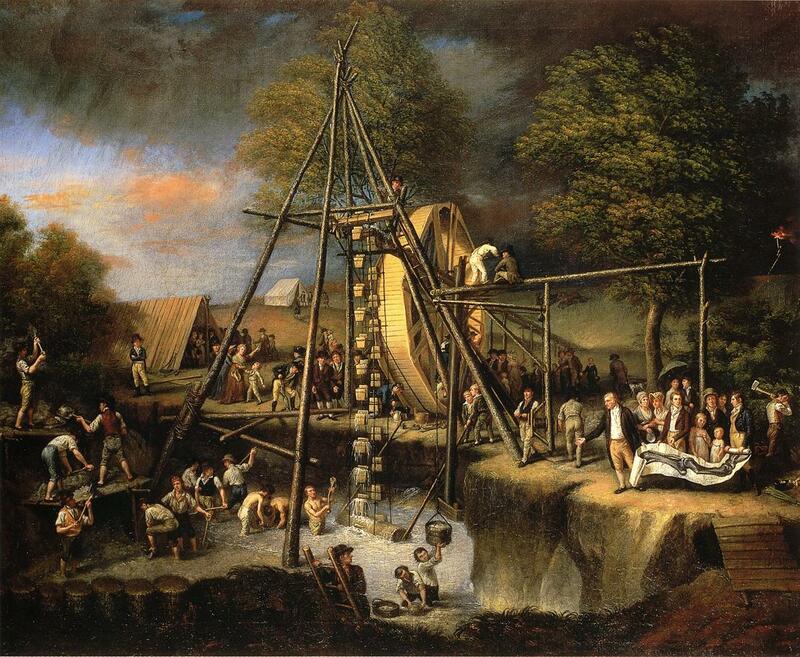 Charles Willson Peale (April 15, 1741 - February 22, 1827) was an American painter, soldier and naturalist. He is best remembered for his portrait paintings of leading figures of the American Revolution, as well as establishing one of the first museums. Peale had a great interest in natural history, and organized the first U.S. scientific expedition in 1801. These two major interests combined in his founding of what became the Philadelphia Museum, and was later renamed the Peale Museum. This museum is considered the first. It housed a diverse collection of botanical, biological, and archaeological specimens. 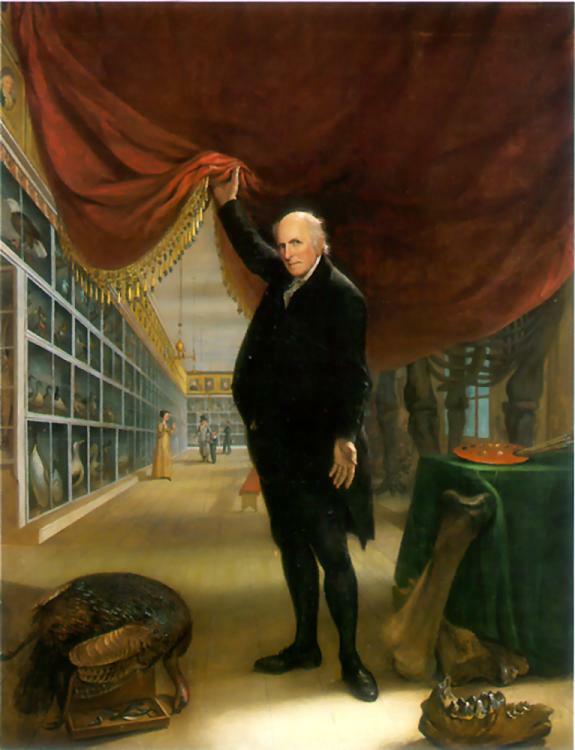 Most notably, the museum contained a large variety of birds which Peale himself acquired, and it was the first to display North American mastodon bones (which in Peale's time were referred to as mammoth bones; these common names were amended by Georges Cuvier in 1800, and his proposed usage is that employed today). Remains of the mastodon discovered in 1799, when workmen was digging in a marl pit on John Masten's farm uncovered a massive femur. A frenzy of digging ensued as neighbors descended upon the site and soon a considerable assemblage of bones laid on the floor of Masten's granary. Interest in these unusual bones soon diminished until the next year when local clergy and physicians alerted of their importance by the American Philosophical Society's appeal sent news of the discovery to associates New York City and ultimately to Philadelphia and Thomas Jefferson. Despite being embroiled in the most serious electoral challenge of the new republic , Jefferson sent an emissary to procure the bones. However, Masten and the local townspeople balked. Charles Willson Peale traveled to Masten's farm in 1801, obstensibly to draw the fossils, but he soon bought the bones on the granary floor and the secured the right to excavate for others. Peale returned to Philadelphia to obtain the support of the American Philosophical Society and Jefferson. Later that year he was back at Masten's farm leading an ambitious excavation, which, unfortunately, yielded little new material. Following leads at other local sites, Peale's team ultimately exhumed a nearly complete second skeleton at Millspaw's Bog. Triumphant, Peale and his skeletons returned to Philadelphia. He spent the next three months reconstructing the animal under the supervision of Caspar Wistar, the leading anatomist of the country; those bones that were not recovered were substituted with either wood or paper mache. The completed first skeleton generated a sensation in its debut at the American Philosophical Society in late December of 1801 and was a rousing success when it was displayed to the public soon thereafter. "Mammoth" fever swept the country. 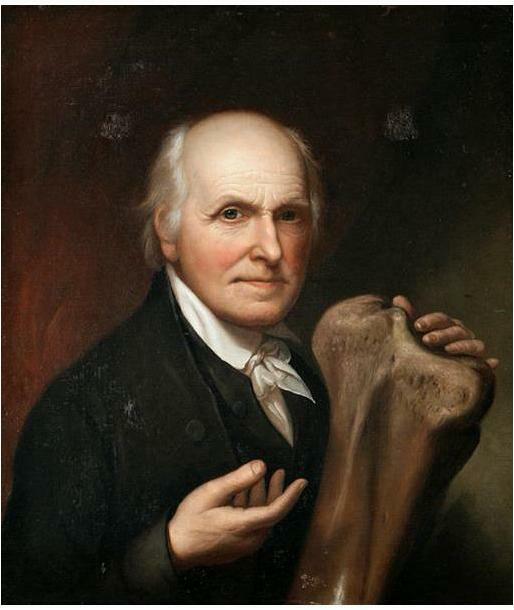 The display of the "mammoth" bones entered Peale into a long standing debate between Thomas Jefferson and Comte de Buffon. Buffon argued that Europe was superior to the Americas biologically, which was illustrated through the size of animals found there. Jefferson referenced the existence of these "mammoths" (which he believed still roamed northern regions of the continent) as evidence for a greater biodiversity in America. Peale's display of these bones drew attention from Europe, as did his method of re-assembling large skeletal specimens in three dimensions. 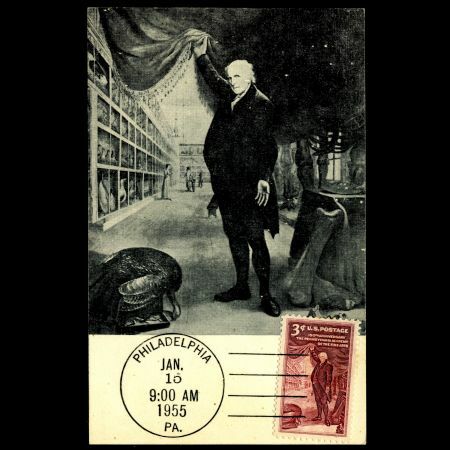 The stamp is reproduction of "The Artist in His Museum", self portret of Charles Peale, painted in 1822. Toward the end of his career, beginning in 1822, he painted seven self-portraits that together formed the final motif of his art and the final flourishing of his talent. The Artist in His Museum is a large-scale oil-on-canvas work painted in about two months, and is the most emblematic of Peale's many self-portraits. In 1822 he was asked by the museum's trustees to paint a full-length portrait of himself for the museum. The 81-year-old artist endeavored to "not only make it a lasting monument of my art as a Painter, but also that the design should be expressive, that I bring forth into public view, the beauties of Nature and Art, the rise & progress of the Museum." He further said, "I wish it may excite some admiration, otherwise my labor is lost, except that it is a good likeness." Peale's determination to honor his career is reflected in his having painted two preliminary versions of The Artist, unusual for an artist who took pride in producing likenesses with little preparatory work. te to the autobiographical statement. The middle ground highlights Peale. In the painting, the artist invites the viewer into his museum; he pulls back a draped crimson curtain, which divides the painting's space, to reveal the collection. He used a similar motif on the printed acknowledgments he sent to museum donors, on which a curtain labeled "Nature" is held back to reveal a landscape with animals. According to critic David C. Ward, the positioning of Peale "has the effect of creating a dialectic between life and art, painter and audience, the individual and American culture at large, and finally past and present. The figure of Peale bridges these realms further drawing attention to and heightening the impact of his creativity." The deep background behind the curtain gives the portrait its unique significance. Peale collected thousands of specimens of birds and other animals for his museum by soliciting donations or hunting them himself. The museum's receding shelves display animal species organized by Linnaean classification, and above them are portraits of revolutionary heroes and other notable Americans, whose placement suggests the position of humans in the great chain of being. Peale believed that physiognomy, whether of humans in portraits or of animal specimens, provided insight into character. To Peale, the behavior of animals served as a model for a moral, productive, and socially harmonious society. In the far background a child represents posterity benefiting from the museum's lessons in natural history. Likewise the woman nearer to the foreground represents the museum's power to inspire feelings of awe and wonder in the face of the sublime. Yet as the space recedes, so does Peale's life and the intellectual and scientific culture of the time the American Enlightenment. 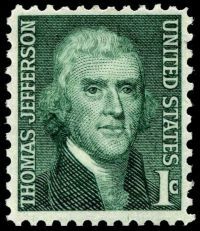 Related stamps: USA 1954 - "Thomas Jefferson third president of the United State"
USA 1968 - "Thomas Jefferson third president of the United State"